In referring to the Burqa bans contemplated or actually in place in Europe, USA Today includes this picture and uses the phrase "face veil". Burqa bans grow fashionable in Europe, By Jabeen Bhatti and Aida Alami, June 27, 2010. Another term used for these things is "headscarf." 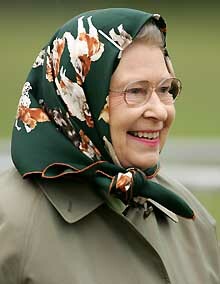 Let's define some terms here—this is a headscarf, as worn by the Queen of England, in an informal outdoor setting. What the modern Islamic woman is wearing is more like a Ninja mask. Not a veil, not a headscarf, a mask. As such, the burqa has frequently been used for purposes of terror and armed robbery, frequently by men. So if we don't ban burqas, we may need more veils.